Contrary to popular belief, growth of Canada's energy sector, particularly the Alberta oil sands, is far from over. In their latest forecast, the Canadian Association of Petroleum Producers (CAPP) sees continued growth in the energy patch and warns that pipeline infrastructure needs to keep pace. Canada's pipeline capacity is currently 4 million bbl/day, very close to Western Canada's 2015 average production of 3.98 million bbl/day. Crude-by-rail has slowed since the peak of 2014 due to increased pipeline capacity and falling production in the US. Existing pipeline capacity will soon be exceeded due to several major projects coming online in the next few years. The US Midwest is Canada's largest export market, consuming 1.9 million bbl/day of Canadian oil. Refineries in Eastern Canada still import about 570,000 bbl/day from the US and overseas due to lack of cross-country infrastructure and limited ability to process heavy oil. About 55% of oil sands production comes from in-situ bitumen extraction. The remainder produced from surface mining operations. Another 850,000 bbl/day of oil production is expected to come online by 2021. That's from projects currently under construction or being expanded. 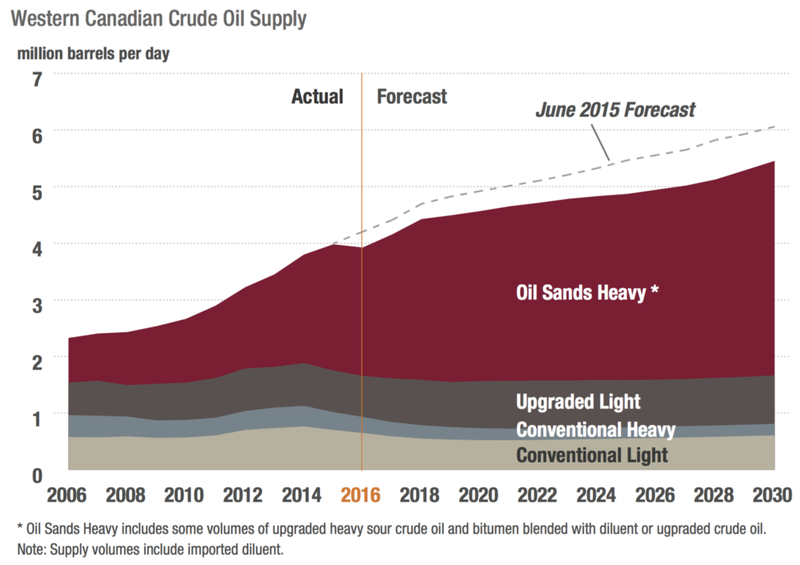 Canada's energy sector expects to produce 4.9 million bbl/day by 2030. That's lower than last year's projection of 5.3 million bbl/day but still represents a 33% increase from current levels. Canada's oil sands produced an average of 2.4 million bbl/day in 2015. That number is expected to rise to 3.7 million bbl/day by 2030. By 2030, 98% of Canada's oil production is expected to come from Western Canada. Over 70% of that oil will be heavy crude from Alberta. All graphics and data courtesy CAPP's 2016 Crude Oil Forecast, Markets and Transportation.